Simon_SW17 wrote: In that photo there are at least 3 planning crimes, makes the debate about Central Square seem nit picky considering all the proposals there are miles ahead of some of these carbuncles. Which is nice. Ty Pont Haern (or "Liberty Bridge" as its called now I think!) is a clear 'planning crime'. What others? Marriott hotel? I know some people don't like Altolusso but I actually do (although it looks less good very close up than from a bit of a distance). The Marriott isn't the best but I was referring to the Ty Pont Haearn, Ibis and the other prison looking hotel which I forget the name of in the foreground. They're appalling for city centre buildings. I think he meant Novotel which is a building that has its merits, in my opinion. Do you mean Maldron rather than Marriot? I'm pretty sure that the Marriot was built on the site of an open air fruit and veg market in the 1980's. The Maldron was built on the site of the Central Hotel which was a nice building in it's day (and complemented the Great Western) but had been badly damaged by fire and neglect and was probably beyond redevelopment. As for crimes against architecture the IBIS and the extension to the Novotel are shocking. Likewise the Holiday Inn Express just around the corner on Bute Dock is also dire. But it's interesting that we are now classing this area as city centre. Just a few years ago it was barelt city centre fringe. That probably explains why these buildings went up in the first place. The original offices on the south side of Tyndall Street are no great shakes either. As an aside I walked through Capital Quarter the other day and it was buzzing with people. When No 3 and No 4 are occupied it will be very busy around there. I wonder if that will lead to development of Adam Street in the next few years? The Marriott covers an area that was demolished before it was constructed, there were some fine buildings here as can be attested by those on Mill lane and the Golden Cross, i dont think the Marriott is to blame for their demise though. 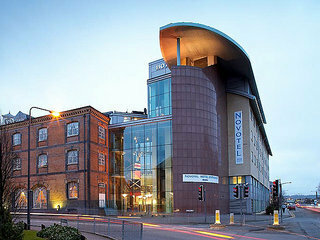 Mr Blue Sky wrote: I think he meant Novotel which is a building that has its merits, in my opinion. I agree on Novotel. I quite like the East facade of the building. What lets it down is the beige brick frontage on Tyndall Street itself. Cardiff wrote: The Marriott covers an area that was demolished before it was constructed, there were some fine buildings here as can be attested by those on Mill lane and the Golden Cross, i dont think the Marriott is to blame for their demise though. Number 2 sold to Tesco pension fund. I noticed a planning app for the vacant ground floor unit in this building the other day...funnily enough for a Tesco. It also mentions tenant announcements on Number 3 being imminent. I wonder if the sale of Number 2 will help them start on any other projects, like the vacant Number 5 plot, or maybe even the first phase of offices at John Street? Hopefully the tower for No.5 is still on the cards. The area should look fantastic if both towers are complete. I'm also happy about the Tesco planning application. It'll be my new local!